Numerous reports suggest that IL-6 promotes survival and proliferation of multiple myeloma (MM) cells through the phosphorylation of a cell signaling protein, STAT3. Thus, agents that suppress STAT3 phosphorylation have potential for the treatment of MM. In the present report, we demonstrate that curcumin (diferuloylmethane), a pharmacologically safe agent in humans, inhibited IL-6–induced STAT3 phosphorylation and consequent STAT3 nuclear translocation. Curcumin had no effect on STAT5 phosphorylation, but inhibited the IFN-α-induced STAT1 phosphorylation. The constitutive phosphorylation of STAT3 found in certain MM cells was also abrogated by treatment with curcumin. Curcumin-induced inhibition of STAT3 phosphorylation was reversible. Compared with AG490, a well-characterized Janus kinase 2 inhibitor, curcumin was a more rapid (30 min vs 8 h) and more potent (10 μM vs 100 μM) inhibitor of STAT3 phosphorylation. In a similar manner, the dose of curcumin completely suppressed proliferation of MM cells; the same dose of AG490 had no effect. In contrast, a cell-permeable STAT3 inhibitor peptide that can inhibit the STAT3 phosphorylation mediated by Src blocked the constitutive phosphorylation of STAT3 and also suppressed the growth of myeloma cells. TNF-α and lymphotoxin also induced the proliferation of MM cells, but through a mechanism independent of STAT3 phosphorylation. In addition, dexamethasone-resistant MM cells were found to be sensitive to curcumin. Overall, our results demonstrated that curcumin was a potent inhibitor of STAT3 phosphorylation, and this plays a role in the suppression of MM proliferation. Multiple myeloma (MM)3 is a B cell malignancy characterized by the latent accumulation in bone marrow of secretory plasma cells with a low proliferative index and an extended life span (1). MM accounts for 1% of all cancers and >10% of all hematologic cancers. Agents used to treat myeloma include combinations of vincristine, 1,3-bis-(2-chloroethyl)-1-nitrosourea, melphalan, cyclophosphamide, adriamycin, and prednisone or dexamethasone (dex) (2). Usually, patients younger than 65 years are treated with high-dose melphalan with autologous stem-cell support, and older patients who cannot tolerate such intensive treatment receive standard-dose oral melphalan and prednisone. Despite these treatments, only 5% of patients achieve complete remission, and the median survival is only 30–36 mo (3, 4). The dysregulation of the apoptotic mechanism in plasma cells is considered a major underlying factor in the pathogenesis and subsequent chemoresistance in MM. It is established that IL-6, produced in either an autocrine or paracrine manner, has an essential role in the malignant progression of MM by regulating the growth and survival of tumor cells (5, 6). IL-6 induces intracellular signaling through a member of the STAT family. Engagement of cell surface cytokine receptors activates the Janus kinase (JAK) family of protein tyrosine kinases, which phosphorylate and activate cytoplasmic STAT proteins (7, 8). Activated STATs dimerize and translocate to the nucleus where they bind to specific DNA response elements and induce expression of STAT-regulated gene expression. One STAT family member, STAT3, has been described in mediating IL-6 signaling through interaction with the IL-6R, and studies using dominant-negative STAT3 proteins have demonstrated a requirement of STAT3 signaling in tumor transformation (9, 10). Evidence is accumulating that constitutive activation of STAT3 proteins occurs frequently in human tumor cells (11, 12, 13, 14), implicating aberrant STAT3 signaling as an important process in malignant progression. Recently, Catlett-Falcone et al. (15) have shown that human MM cells also express constitutively activated STAT3, which confers resistance to apoptosis in these cells through expression of high levels of the anti-apoptotic protein Bcl-xL (15, 16, 17). Bcl-2 overexpression, another important characteristic of most MM cell lines (18), rescues these tumor cells from chemotherapy-induced apoptosis (4, 19). Thus, pharmacologically safe and effective agents that can block constitutive or inducible activation of STAT3 as treatments have a potential for MM and other diseases. Recently we have shown that curcumin (diferuloylmethane) can suppress the proliferation of MM cells, and this correlates with suppression of NF-κB (20). Further, curcumin has been shown to down-regulate the expression of Bcl-xL and cyclinD1 (20, 21, 22), which are also regulated by activation of STAT3 (23, 24). Whether curcumin can also suppress constitutive or inducible activation of STAT3 in MM was investigated in the present report. Human MM cell lines U266, RPMI 8226, and MM.1S were obtained from the American Type Culture Collection (Manassas, VA). Cell lines U266 (ATCC TIB-196) and RPMI 8226 (ATCC CCL-155) are plasmacytomas of B cell origin. U266 is known to produce mAbs and IL-6 (5, 25). RPMI 8226 produces only Ig L chains, and there is no evidence for H chain or IL-6 production. The MM.1 (also called MM.1S) cell line, established from the peripheral blood cells of a patient with IgA myeloma, secretes λ L chain, is negative for the presence of the EBV genome, and expresses leukocyte Ag DR, plasma cell Ag-1, T9, and T10 Ags (26). MM.1R is a dex-resistant variant of MM.1 cells, also known as MM.1S (27), and was kindly provided by Dr. S. T. Rosen of Northwestern University Medical School (Chicago, IL). Human MM cell line OCI was kindly provided by Dr. J. Berenson from Cedars-Sinai Hospital (Los Angeles, CA). The rabbit polyclonal Abs to STAT1, STAT3, STAT5, and STAT6, and mouse mAbs against phospho-STAT3 were obtained from Santa Cruz Biotechnology (Santa Cruz, CA). Goat anti-rabbit-HRP conjugate was purchased from Bio-Rad (Hercules, CA). Goat anti-mouse HRP was purchased from Transduction Laboratories (Lexington, KY), and goat anti-rabbit Alexa 594 was purchased from Molecular Probes (Eugene, OR). Hoechst 33342 and MTT were purchased from Sigma-Aldrich (St. Louis, MO). Curcumin with a purity >98% was purchased from LKT Laboratories (St. Paul, MN), and was prepared as a 20-mM solution in DMSO and then further diluted in cell culture medium. RPMI 1640, FBS, 0.4% trypan blue vital stain, and antibiotic-antimycotic mixture were obtained from Life Technologies (Grand Island, NY). Protein A/G-Sepharose beads were obtained from Pierce (Rockford, IL), and [3H]thymidine was obtained from Amersham Pharmacia Biotech (Piscataway, NJ). Cell-permeable STAT3 inhibitory peptide and AG490 were from Calbiochem (San Diego, CA). Bacteria-derived recombinant human IL-6 was kindly provided by Novartis Pharmaceuticals (East Hanover, NJ). IFN-α, was kindly provided by Schering-Plough (Kenilworth, NJ). Bacteria-derived recombinant human TNF and lymphotoxin (LT) were kindly provided by Genentech (South San Francisco, CA). All the human MM cell lines were cultured in RPMI 1640 medium containing 1× antibiotic-antimycotic. U266, MM.1S, RPMI 8226, and MM.1R were cultured in 10% FBS, whereas cell line OCI was grown in Iscove’s modified Eagle’s medium with 15% FBS. Cells were free of mycoplasma contamination as tested by Hoechst staining and by RT-PCR. For detection of STAT proteins, whole-cell extracts were prepared by lysing the curcumin-treated cells in lysis buffer (20 mM Tris (pH 7.4), 250 mM NaCl, 2 mM EDTA (pH 8.0), 0.1% Triton X-100, 0.01 mg/ml aprotinin, 0.005 mg/ml leupeptin, 0.4 mM PMSF, and 4 mM NaVO4). Lysates were then spun at 14,000 rpm for 10 min to remove insoluble material, and resolved on a 7.5% gel. After electrophoresis, the proteins were electrotransferred to a nitrocellulose membrane, blocked with 5% nonfat milk, and probed with anti-STAT Abs (1:1000) overnight at 4°C. The blot was washed, exposed to HRP-conjugated secondary Abs for 1 h, and finally examined by chemiluminescence (ECL; Amersham Pharmacia Biotech). Curcumin-treated MM cells were plated on a glass slide by centrifugation using a Cytospin 4 (Thermoshendon, Pittsburg, PA), air-dried for 1 h at room temperature, and fixed with cold acetone. After a brief washing in PBS, slides were blocked with 5% normal goat serum for 1 h and then incubated with rabbit polyclonal anti-human STAT3 Ab (dilution, 1/100). After overnight incubation, the slides were washed and then incubated with goat anti-rabbit IgG-Alexa 594 (1/100) for 1 h and counterstained for nuclei with Hoechst (50 ng/ml) for 5 min. Stained slides were mounted with mounting medium (Sigma-Aldrich) and analyzed under an epifluorescence microscope (Labophot-2; Nikon, Tokyo, Japan). Pictures were captured using a Photometrics Coolsnap CF color camera (Nikon) and MetaMorph version 4.6.5 software (Universal Imaging, Downingtown, PA). The antiproliferative effects of curcumin against different MM cell lines were determined by the MTT dye uptake method as described earlier (28). Briefly, the cells (5000/well) were incubated in triplicate in a 96-well plate in the presence or absence of indicated test samples in a final volume of 0.1 ml for 24 h at 37°C. Thereafter, 0.025 ml of MTT solution (5 mg/ml in PBS) was added to each well. After a 2-h incubation at 37°C, 0.1 ml of the extraction buffer (20% SDS, 50% dimethylformamide) was added, and the extract was incubated overnight at 37°C for solubilization of formazan crystals. The OD at 570 nm was measured using a 96-well multiscanner autoreader (Dynatech MR 5000) with the extraction buffer serving as blank. The percentage of cell viability was calculated using the following formula: percentage cell viability = (OD of the experiment samples/OD of the control) × 100. The antiproliferative effects of curcumin were also monitored by the thymidine incorporation method. For this, 5000 cells in 100 μl of medium were cultured in triplicate in 96-well plates in the presence or absence of curcumin for 24 h. Six hours before completion of the experiment, cells were pulse treated with 0.5 μCi [3H]thymidine, and the uptake of [3H]thymidine was monitored using a Matrix-9600 beta-counter (Packard Instrument, Downers Grove, IL). In the present report, we investigated the effect of curcumin on constitutively active and IL-6-inducible STAT3 phosphorylation in MM cells. We used five different well-characterized MM cell lines. The dose and duration of curcumin treatment to examine STAT3 phosphorylation had no effect on the cell viability (data not shown). We investigated whether curcumin inhibits the constitutive STAT3 phosphorylation in U266. U266 cells were incubated either with different concentrations of curcumin for 1 h or with 50 μM curcumin for different times. Curcumin inhibited the constitutively active STAT3 in a dose- (Fig. 1⇓A) and time- (Fig. 1⇓B) dependent manner. Curcumin-induced inhibition could be observed as early as 10 min, and with a concentration as low as 10 μM. Curcumin at 50 μM for 1 h completely inhibited STAT3 phosphorylation. Curcumin treatment did not alter the overall expression of STAT3 protein. 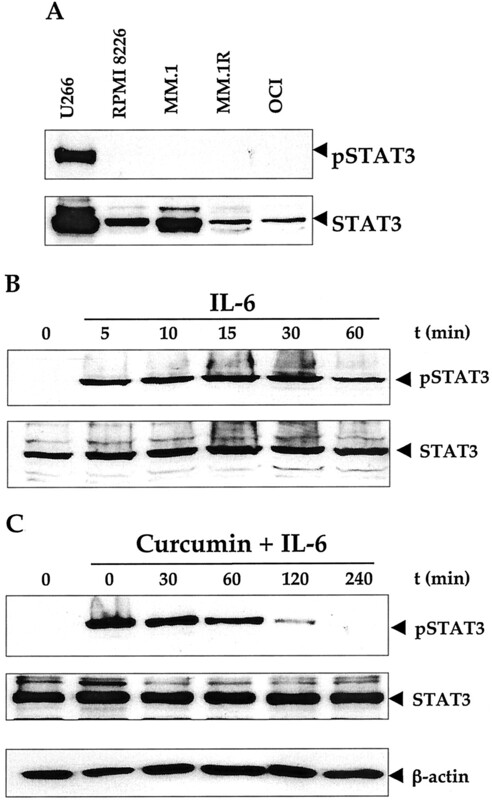 Curcumin inhibits constitutive STAT3 phosphorylation in U266 cells in a dose- (A) and time- (B) dependent manner. U266 cells (2 × 106) were treated with the indicated concentrations of curcumin for 1 h, or with 50 μM curcumin for the indicated durations, and levels of phosphorylated STAT3 (pSTAT3) (upper panels) and STAT3 (lower panels) were examined in whole cell extracts by Western blotting. C, Curcumin specifically inhibits constitutive phosphorylation of STAT3, but not of STAT5, in U266 cells. U266 cells (2 × 106) were treated with 50 μM curcumin for the indicated durations and examined for phosphorylated and nonphosphorylated STAT3 and STAT5. D, Curcumin inhibits IFN-α-inducible STAT1 phosphorylation. U266 cells (2 × 106) were preincubated with curcumin (50 μM) for the indicated durations before treatment with IFN-α (10 ng/ml) for an additional 30 min, and then examined for phosphorylated and nonphosphorylated-STAT1. Whether curcumin affects the phosphorylation of other STAT proteins in U266 cells was investigated. Besides STAT3, we found that U266 cells expressed STAT5 (Fig. 1⇑C). These cells also expressed constitutively phosphorylated STAT5. Hence, we investigated whether curcumin affected the constitutive phosphorylation of STAT5. Under the conditions where curcumin completely inhibited STAT3 phosphorylation, it neither altered the levels of constitutively phosphorylated STAT5 nor the expression of STAT5. Our results show that U266 cells expressed STAT1, but it was not phosphorylated (Fig. 1⇑D). To determine the effect of curcumin on STAT1 phosphorylation, U266 cells were pretreated with IFN-α and then exposed to curcumin for different times. Our results show that IFN-α induced STAT1 phosphorylation, and curcumin suppressed the phosphorylation in a time-dependent manner (Fig. 1⇑D). Under resting conditions, and in the nonphosphorylated state, STAT3 is retained in the cytoplasm. It translocates to the nucleus when phosphorylated (7). Phosphorylation induces STAT3 dimerization, thus permitting its translocation into the nucleus. To confirm that curcumin suppresses nuclear translocation of STAT3, curcumin-treated and untreated cells were cytospun on a glass slide, immunostained with Ab to STAT3, and then visualized by the Alexa-594-conjugated second Ab as described in Materials and Methods. Fig. 2⇓ clearly demonstrates that curcumin prevented translocation of the STAT3 to the nucleus in U266 cells, consistent with the curcumin-induced inhibition of STAT3 phosphorylation. Curcumin induces redistribution of STAT3. U266 cells were incubated alone or with curcumin (50 μM) for 60 min, and then analyzed for the distribution of STAT3 by immunocytochemistry (original magnification ×200). Because IL-6-induced signals are mediated through STAT3 phosphorylation, we examined the status of STAT3 phosphorylation. All MM cell lines express STAT3, but only U266 expressed a constitutively phosphorylated STAT3 (Fig. 3⇓A). These results are consistent with our previous observations that only U266 constitutively secretes IL-6 (20). IL-6 induces STAT3 phosphorylation in human MM RPMI 8226 cells, and curcumin inhibits it. A, U266, but not other human MM cells, express phosphorylated STAT3. U266, RPMI 8226, MM.1S, MM.1R, and OCI cells (2 × 106) were lysed, and 30 μg of whole-cell extracts were resolved on 7.5% SDS-PAGE, electrotransferred to a nitrocellulose membrane, and probed for phosphorylated-STAT3 (upper panel) and STAT3 (lower panel). B, RPMI 8226 cells (2 × 106 cells) were treated with IL-6 (10 ng/ml) for the indicated time, and whole-cell extracts were prepared. C, RPMI 8226 cells (2 × 106 cells) were treated with 50 μM curumin for the indicated durations and stimulated with IL-6 (10 ng/ml) for 10 min, and whole-cell extracts were prepared. Thirty micrograms of whole cell extracts were resolved on 7.5% SDS-PAGE, electrotransferred to a nitrocellulose membrane, and probed for the phosphorylated-STAT3 (upper panel) and stripped and reprobed for STAT3 (middle panel) and β-actin (lower panel). Because IL-6 is a growth factor for MM and induces STAT3 phosphorylation (5, 6, 15), we checked whether curcumin could inhibit IL-6-induced STAT3 phosphorylation. RPMI 8226 cells (which do not express constitutively phosphorylated STAT3) were treated with IL-6. 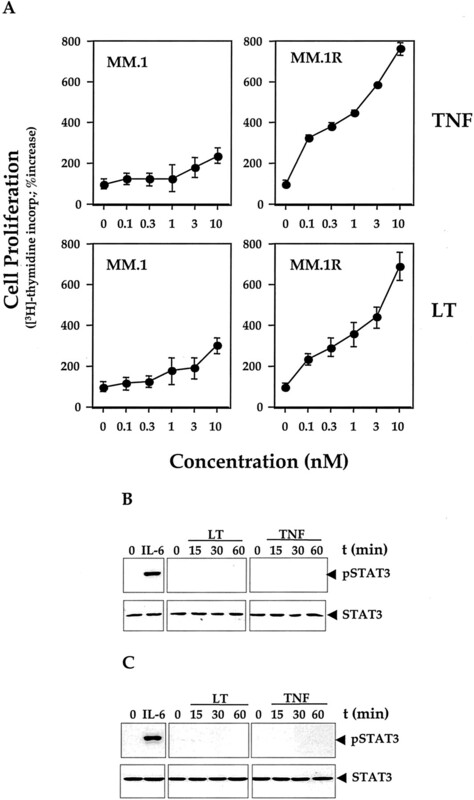 IL-6 induced phosphorylation of STAT3 as early as 5 min, and began to decline at 60 min (Fig. 3⇑B). RPMI 8226 cells were then incubated with curcumin for different times and examined for IL-6-inducible STAT3 phosphorylation. As seen in Fig. 3⇑C, IL-6-induced STAT3 phosphorylation was blocked by curcumin in a time-dependent manner. Exposure of cells to curcumin for 4 h was sufficient to completely suppress IL-6-induced STAT3 phosphorylation. Curcumin alone had no effect on STAT3 phosphorylation in these cells (data not shown). We further examined whether curcumin-induced inhibition of STAT3 phosphorylation is reversible. U266 cells were first treated for 60 min with curcumin, and then the cells were washed twice with PBS to remove curcumin. The cells were then cultured in the fresh medium for various durations, and the levels of phosphorylated STAT3 were measured. Curcumin induced the suppression of STAT3 phosphorylation (Fig. 4⇓, left panel), and the removal of curcumin resulted in a gradual increase in phosphorylated STAT3 (Fig. 4⇓, right panel). The reversal was complete by 24 h, and did not involve the changes in STAT3 levels. Curcumin-induced inhibition of STAT phosphorylation is reversible. U266 cells (2 × 106 cells) were treated with 50 μM curcumin for the indicated durations (left panels) or treated for 1 h and washed with PBS two times to remove curcumin before resuspension in fresh medium. Cells were removed at indicated times and lysed to prepare the whole cell extract (right panels). Thirty micrograms of whole cell extracts were resolved on 7.5% SDS-PAGE, electrotransferred to a nitrocellulose membrane, probed for the phosphorylated-STAT3 (upper panels) and stripped and reprobed for STAT3 (middle panels) and β-actin (lower panels). AG490 is a well-characterized inhibitor of STAT3 phosphorylation (29). It has certain structural features that are similar to those of curcumin (see Fig. 5⇓A). We investigated how the activity of AG490 compares with curcumin in inhibiting STAT3 phosphorylation. A 100 μM dose of AG490 is needed to completely inhibit STAT3 phosphorylation. Next, we first examined the kinetics of inhibition by AG490 for STAT3 phosphorylation (Fig. 5⇓B), and exposure of cells to 100 μM AG490 for 8 h was needed to completely inhibit STAT3 phosphorylation (Fig. 5⇓C). In comparison, treatment of cells with 50 μM curcumin for 60 min was sufficient to inhibit STAT3 phosphorylation (see Fig. 1⇑, A and B). 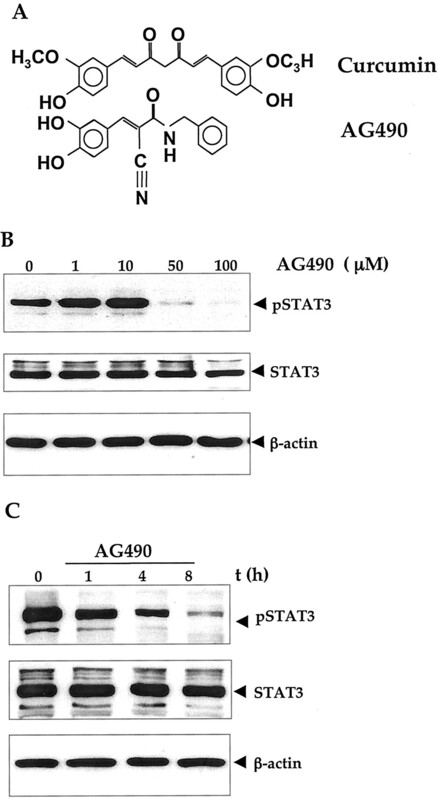 Effect of AG490 on STAT3 phosphorylation in U266 cells. A, Structural similarity between curcumin and AG490. B, U266 cells (2 × 106 cells) were treated with indicated concentrations of AG490 for 8 h; or C, treated with 100 μM AG490 for the indicated durations, and whole-cell extracts were prepared. Thirty micrograms of whole-cell extract was resolved on 7.5% SDS-PAGE, electrotransferred to a nitrocellulose membrane, probed for the phospho-STAT3 (upper panel), stripped, and reprobed for STAT3 (middle panel) and β-actin (lower panel). STAT3iP (Fig. 6⇓A) is a cell-permeable analog of the STAT3-Src homology 2 domain-binding phosphopeptide that acts as a highly selective potent blocker of STAT3 activation (30). Next, we examined the effect of this peptide inhibitor of constitutive STAT3 phosphorylation in U266 cells. Results shown in Fig. 6⇓B show that 100 μM STAT3iP inhibits STAT3 phosphorylation completely within 1 h.
Effect of cell-permeable STAT3iP on STAT3 phosphorylation and cell viability in U266 cells. A, Sequence of STAT3iP. B, U266 cells were incubated alone or with STAT3iP (100 μM) for 1 h, and cellular localization of STAT3 was examined by immunocytochemistry (original magnification, ×200). C, U266 cells (2 × 104 cell) were incubated alone or with 50 or 100 μM STAT3iP for indicated days, and viable cells were counted using the trypan blue cell viability test. Results are shown as the mean (± SD indicated by error bar) of absorbance (570 nm) of triplicate cultures compared with the untreated control. Because STAT3 phosphorylation has been linked with the proliferation of MM cells, we examined the effect of STAT3iP on the proliferation of U266 cells. It was found that STAT3iP suppressed the U266 cells (Fig. 6⇑C). To reconfirm previous reports (5, 6, 15, 31) that IL-6 induces proliferation of MM cells, we serum-starved U266, RPMI 8226, MM.1, and MM.1R for 12 h and then cultured them in the absence or presence of different concentrations of IL-6 for 48 h. IL-6 induced proliferation of U266, MM.1, and MM.1R in a dose-dependent manner (Fig. 7⇓A). However, RPMI 8226 cells did not respond to IL-6 stimulation. IL-6 induces proliferation of human MM cells, and curcumin inhibits it. A, Human MM cells U266, RPMI 8226, MM.1, and MM.1R were serum starved for 12 h and then cultured with the indicated concentrations of IL-6 for 48 h in a serum-free medium. B, U266, MM.1, and MM.1R cells were serum starved for 12 h and then cultured with the indicated concentrations of IL-6 in the absence or presence of curcumin (10 μM) for 48 h in a serum-free medium. Cell proliferation assays were performed as described in Materials and Methods. Results are shown as mean (± SD) of percent [3H]thymidine incorporation or percent proliferation by MTT of triplicate cultures compared with the untreated control. We next determined whether curcumin suppresses the proliferative effects of IL-6. Both the thymidine incorporation (Fig. 7⇑B, upper left panel) and MTT methods (Fig. 7⇑B, upper right panel) showed that IL-6-induced proliferation of U266 cells was completely inhibited by curcumin. 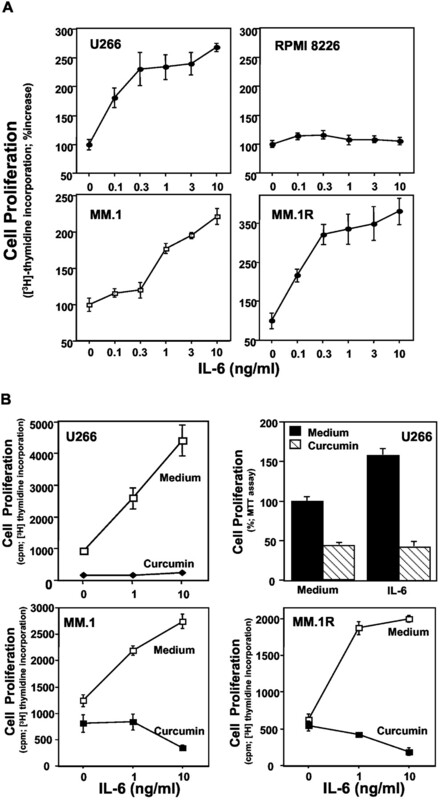 In a similar manner, curcumin also inhibited IL-6-induced cell proliferation in MM.1 and MM.1R cell lines (Fig. 7⇑B, lower panels). Besides IL-6, TNF and LT have been shown to be produced by MM cells and are known to induce their proliferation (32, 33, 34, 35). Furthermore, TNF has been shown to activate STAT3 signaling in different cell types (36, 37). Therefore, we investigated whether TNF and LT stimulation of the growth of MM cells was mediated through STAT 3 phosphorylation. MM.1S and MM.1R cells were serum-starved for 12 h and then treated with TNF or LT in the serum-free medium. The proliferative effects of TNF and LT were more pronounced in dex-resistant MM.1R cells than in dex-sensitive MM.1S cells (Fig. 8⇓A). When examined for STAT3 phosphorylation, we found that IL-6 induced STAT3 phosphorylation in both cell lines, but neither TNF nor LT induced STAT3 phosphorylation in either cell line (Fig. 8⇓, B and C). TNF and LT can induce proliferation, but do not induce STAT3 phosphorylation of human MM cells. A, MM.1S and MM.1R were serum starved for 12 h and then cultured with the indicated concentrations of TNF and LT for 48 h in a serum-free medium. The cell proliferation assay was performed as described in Materials and Methods. Results are shown as the mean (± SD indicated by error bar) of the percentage of [3H]thymidine incorporation of triplicate cultures compared with the untreated control. B, MM.1S cells; or C, MM.1R (2 × 106 cells) were treated with 1 nM TNF or LT for the indicated durations, and whole-cell extracts were prepared. Cells were treated with IL-6 for 10 min as a positive control for STAT3 phosphorylation. Thirty micrograms of whole cell extract were resolved on 7.5% SDS-PAGE, electrotransferred to a nitrocellulose membrane, and probed for phosphorylated-STAT3 (upper panel), stripped, and reprobed for STAT3 (lower panel). MM treated with dex gradually develops resistance to this drug. Although the mechanism of dex-resistance is not understood, we found that curcumin inhibited the proliferation of dex-resistant and dex-sensitive MM cells in a similar manner (Fig. 9⇓). Effect of curcumin (Cur) on cell growth of dex-sensitive and dex-resistant MM cells. MM.1S and MM.1R cells were cultured with dex (1 μM) in the absence or presence of curcumin (10 μM) for 3 days, and cell viability was checked by the MTT method. Results are shown as the mean (± SD indicated by error bar) of percent cell growth of triplicate cultures compared with the untreated control. Because STAT3 phosphorylation plays a critical role in transformation and proliferation of tumor cells, we investigated the effect of curcumin on STAT3 phosphorylation in human MM cells. We found that curcumin abrogated both constitutive and IL-6-induced phosphorylation of STAT3 in certain MM cells, but had no effect on STAT5 phosphorylation. Curcumin-induced inhibition of STAT3 phosphorylation was reversible. Curcumin was found to be a more rapid and more potent inhibitor of STAT3 phosphorylation than AG490. Curcumin suppressed the proliferative effects of IL-6. TNF-α and LT also induced the proliferation of MM cells, but through a mechanism independent of STAT3 phosphorylation. MM cells were found to be sensitive to curcumin, regardless of whether they were resistant (MM.1R) or sensitive (MM.1S) to dex. Only one of five MM cell lines (U266) we tested expressed constitutively active STAT3. Others have also shown that STAT3 is constitutively active in U266 cells (15), and IL-6 induces proliferation of these cells (15, 31, 38). Catlett-Falcone et al. (15) showed that almost 8 of 24 MM patients showed constitutively active STAT3. We found that 6 of 12 MM patients showed constitutively active STAT3 (our unpublished data). Constitutive active STAT3 has been found to be oncogenic and to transform a wide variety of cells, including breast, lymphoid, and myeloid cells (11, 12, 13, 14). Constitutively active STAT3 has been implicated in the induction of resistance to apoptosis (15), possibly through the expression of Bcl-xL and cyclinD1 (23, 24). Our results show that curcumin completely eliminated the constitutively phosphorylated form of STAT3. We found that curcumin also abolished the IL-6-induced STAT3 phosphorylation in MM cells that do not express constitutive STAT3. The effect of curcumin was specific in that it did not affect the phosphorylation state of STAT5 in MM cells. Previously, we have shown that curcumin down-regulates the expression of cyclinD1 and Bcl-xL in MM cells (20, 21, 22). These two genes are known to be regulated by both STAT3 and NF-κB (23, 24), and the down-regulation of NF-κB by curcumin in MM cells has been reported (20). Thus, it is possible that curcumin down-regulates the expression of cyclinD1 and Bcl-xL through down-regulation of both NF-κB and STAT3 activation. We found that suppression of STAT3 phosphorylation was reversible, returning to control values within 24 h.
Our results indicate that exogenous IL-6 induced the proliferation of U266 and MM.1R cells, but not RPMI 8226 cells. Even though U266 cells express constitutively active STAT3 and secrete IL-6, their optimum growth still appears to be dependent on exogenous IL-6. In contrast, RPMI 8226 cells, which have no constitutively active STAT3, required IL-6 exposure for activation of STAT3. However, the activation of this STAT3 was not sufficient for the proliferation of RPMI 8226 cells. We found that TNF and LT also induced proliferation of MM cells, but this was independent of STAT3 phosphorylation. Our results further indicate that curcumin blocked IL-6-induced proliferation of MM cells. Our results with MM are in agreement with a previous report by Natarajan and Bright (39) who showed that curcumin can inhibit IL-12-induced STAT3 phosphorylation by inhibiting JAK2 activation in T cells. AG490, probably the best known inhibitor of STAT3 phosphorylation (29), was a less potent inhibitor of STAT3 phosphorylation than curcumin. A longer exposure (12 h vs 30 min) and higher dose (100 μM vs 10 μM) of AG490 was needed to suppress STAT3 phosphorylation. In a similar manner, although exposure of cells to 100 μM curcumin for 24 h completely suppressed the proliferation of MM cells, the same dose and duration of exposure to AG490 had no effect (data not shown). AG490 is considered to be an inhibitor of JAK2 (29), a kinase that phosphorylates STAT3. Several other kinases have been implicated in the phosphorylation of STAT3, including members of the Src family (hck, src), Erb2, anaplastic lymphoma kinase, protein kinase C-δ, c-fes, and epidermal growth factor receptor (41, 42, 43, 44, 45, 46, 47, 48, 49, 50, 51, 52, 53, 54, 55). Whether any of these kinases are active in MM cells, and which of these kinases is activated by IL-6, is not fully known. AG490 is known to inhibit the mitogen-activated protein kinase pathway (56) as well as the JAK2 pathway. Among the kinases known to phosphorylate STAT3, those inhibited by curcumin are not known. There are reports that curcumin can inhibit JAK2 (39, 40), Src (57) and Erb2 (58), and epidermal growth factor receptor (59); so inhibition of any of these could explain the inhibitory effects of curcumin on STAT3 phosphorylation. 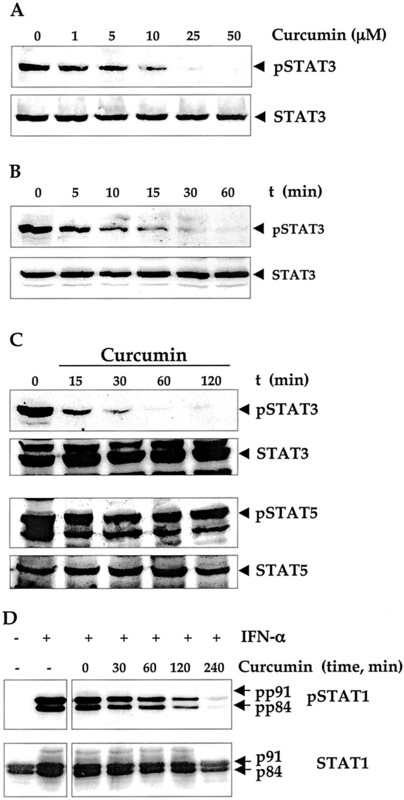 Whether suppression of cell proliferation by curcumin is caused only by inhibition of the nuclear translocation of STAT3 requires further investigation. Recently, STATiP has been developed as a highly selective and potent inhibitor of STAT3 activation (30). STAT3iP suppresses constitutive STAT3 activation mediated by Src. Our results indicate that STAT3iP express similar STAT3 inhibitory activity as curcumin. Both agents block STAT3 phosphorylation within 1 h. In addition, STAT3iP also suppressed the growth of MM cells. STAT3iP was less effective in its growth suppressive effect compared with curcumin, which indicates the suppression of other transcription factors that promote cell viability and proliferation. We have recently described the essential role of NF-κB in survival and proliferation of MM cells (20). Because curcumin can effectively inhibit activation of both STAT3 and NF-κB, it is expected that curcumin should suppress cell proliferation more efficiently than specific inhibitors of either transcription factor alone. Because there is considerable evidence that STAT3 is involved in the transformation of cells, the activity of STAT3 as a transcriptional activator is a prime anticancer target. First, all Src-transformed cell lines have persistently activated STAT3, and dominant-negative STAT3 blocks transformation (60, 61). Dominant-negative STAT3 has also been shown to induce apoptosis in cells with constitutively active STAT3 (15). Second, STAT3-C, a constitutively active mutant dimerized by cysteine-cysteine bridges instead of pTyr-Src homology 2 domain interaction, can transform cultured cells so that they form tumors when injected into mice (62). Indeed, STAT3 functions in normal lymphocyte development to resist apoptosis (63, 64). Third, besides MM, head and neck cancers (65), hepatocellular carcinoma (66), lymphomas, and leukemia (67) have constitutively active STAT3. Because there is no reported mutation in STAT3 that results in persistent activation, the only putative mechanism to account for the constitutive activity of STAT3 is dysregulation of signaling molecules, or mutation or deletions in the protein that negatively regulate STAT3 (e.g., protein inhibitor of activated STAT-3 or suppressor of cytokine signaling) (66). For instance suppressor of cytokine signaling-1, a negative regulator of cytokine signaling, is frequently silenced by methylation (68). Thus, constitutively active STAT3 can contribute to oncogenesis by protecting cancer cells from apoptosis. This implies that suppression of STAT3 activation by agents such as curcumin, as described in this study, could facilitate apoptosis. Our results also indicate that curcumin can overcome dex resistance of MM cells. Thus in conclusion, the ability to suppress STAT3 phosphorylation, inhibit IL-6 signaling, down-regulate the expression of IL-6, cyclinD1, and Bcl-xL (20), inhibit proliferation of MM cells, and overcome drug resistance, combined with its well established pharmacological safety (69, 70, 71, 72, 73), suggest that curcumin should be tested in MM patients. We thank Walter Pagel for critically reading this manuscript. ↵1 This work was supported by the Clayton Foundation for Research (to B.B.A.). ↵3 Abbreviations used in this paper: MM, multiple myeloma; JAK, Janus kinase; LT, lymphotoxin; dex, dexamethasone; STAT3iP, STAT3 inhibitor peptide. Hallek, M., P. L. Bergsagel, K. C. Anderson. 1998. Multiple myeloma: increasing evidence for a multistep transformation process. Blood 91:3. UK myeloma forum. British Committee for Standards in Haemotology. 2001. Diagnosis and management of multiple myeloma. Br. J. Haematol. 115:522. Anonymous 1992. Report. 1973–1989 Annual Cancer Statistics Review National Cancer Institute, Bethesda. Feinman, R., J. Koury, M. Thames, B. Barlogie, J. Epstein, D. S. Siegel. 1999. Role of NF-κB in the rescue of multiple myeloma cells from glucocorticoid-induced apoptosis by bcl-2. Blood 93:3044. Klein, B., X. G. Zhang, Z. Y. Lu, R. Bataille. 1995. Interleukin-6 in human multiple myeloma. Blood 85:863. Darnell, J. E., Jr.. 1997. STATs and gene regulation. Science 277:1630. Taga, T., T. Kishimoto. 1997. Gp130 and the interleukin-6 family of cytokines. Annu. Rev. Immunol. 15:797. Bromberg, J. F., C. M. Horvath, D. Besser, W. W. Lathem, J. E. Darnell, Jr.. 1998. Stat3 activation is required for cellular transformation by v-src. Mol. Cell Biol. 18:2553. Turkson, J., T. Bowman, R. Garcia, E. Caldenhoven, R. P. De Groot, R. Jove. 1998. Stat3 activation by Src induces specific gene regulation and is required for cell transformation. Mol. Cell Biol. 18:2545. Garcia, R., R. Jove. 1998. Activation of STAT transcription factors in oncogenic tyrosine kinase signaling. J. Biomed. Sci. 5:79. Garcia, R., C. L. Yu, A. Hudnall, R. Catlett, K. L. Nelson, T. Smithgall, D. J. Fujita, S. P. Ethier, R. Jove. 1997. Constitutive activation of Stat3 in fibroblasts transformed by diverse oncoproteins and in breast carcinoma cells. Cell Growth Differ. 8:1267. Weber-Nordt, R. M., C. Egen, J. Wehinger, W. Ludwig, V. Gouilleux-Gruart, R. Mertelsmann, J. Finke. 1996. Constitutive activation of STAT proteins in primary lymphoid and myeloid leukemia cells and in Epstein-Barr virus (EBV)-related lymphoma cell lines. Blood 88:809. Takemoto, S., J. C. Mulloy, A. Cereseto, T. S. Migone, B. K. Patel, M. Matsuoka, K. Yamaguchi, K. Takatsuki, S. Kamihira, J. D. White, et al 1997. Proliferation of adult T cell leukemia/lymphoma cells is associated with the constitutive activation of JAK/STAT proteins. Proc. Natl. Acad. Sci. USA 94:13897. Catlett-Falcone, R., T. H. Landowski, M. M. Oshiro, J. Turkson, A. Levitzki, R. Savino, G. Ciliberto, L. Moscinski, J. L. Fernandez-Luna, G. Nunez, et al 1999. Constitutive activation of Stat3 signaling confers resistance to apoptosis in human U266 myeloma cells. Immunity 10:105. Tu, Y., S. Renner, F. Xu, A. Fleishman, J. Taylor, J. Weisz, R. Vescio, M. Rettig, J. Berenson, S. Krajewski, et al 1998. BCL-X expression in multiple myeloma: possible indicator of chemoresistance. Cancer Res. 58:256. Grad, J. M., X. R. Zeng, L. H. Boise. 2000. Regulation of Bcl-xL: a little bit of this and a little bit of STAT. Curr. Opin. Oncol. 12:543. Pettersson, M., H. Jernberg-Wiklund, L. G. Larsson, C. Sundstrom, I. Givol, Y. Tsujimoto, K. Nilsson. 1992. Expression of the bcl-2 gene in human multiple myeloma cell lines and normal plasma cells. Blood 79:495. Tu, Y., F. H. Xu, J. Liu, R. Vescio, J. Berenson, C. Fady, A. Lichtenstein. 1996. Upregulated expression of BCL-2 in multiple myeloma cells induced by exposure to doxorubicin, etoposide, and hydrogen peroxide. Blood 88:1805. Bharti, A. C., N. Donato, S. Singh, B. B. Aggarwal. 2003. Curcumin (diferuloylmethane) down-regulates the constitutive activation of nuclear factor-κB and IκBα kinase in human multiple myeloma cells, leading to suppression of proliferation and induction of apoptosis. Blood 101:1053. Han, S. S., S. T. Chung, D. A. Robertson, D. Ranjan, S. Bondada. 1999. Curcumin causes the growth arrest and apoptosis of B cell lymphoma by downregulation of egr-1, c-myc, Bcl-XL, NF-κB, and p53. Clin. Immunol. 93:152. Mukhopadhyay, A., S. Banerjee, L. J. Stafford, X. Xia Chunzhi, M. Liu, B. B. Aggarwal. Circumin-induced suppression of cell proliferation correlates with downregulation of cyclin D1 expression and CDK4-mediated retinoblastoma protein phosphorylation. Oncogene 21:8852. Fujio, Y., K. Kunisada, H. Hirota, K. Yamauchi-Takihara, T. Kishimoto. 1997. Signals through gp130 upregulate bcl-x gene expression via STAT1-binding cis-element in cardiac myocytes. J. Clin. Invest. 99:2898. Sinibaldi, D., W. Wharton, J. Turkson, T. Bowman, W. J. Pledger, R. Jove. 2000. Induction of p21WAF1/CIP1 and cyclin D1 expression by the Src oncoprotein in mouse fibroblasts: role of activated STAT3 signaling. Oncogene 19:5419. Nilsson, K., H. Bennich, S. G. Johansson, J. Ponten. 1970. Established immunoglobulin producing myeloma (IgE) and lymphoblastoid (IgG) cell lines from an IgE myeloma patient. Clin. Exp. Immunol. 7:477. Goldman-Leikin, R. E., H. R. Salwen, C. V. Herst, D. Variakojis, M. L. Bian, M. M. Le Beau, P. Selvanayagan, R. Marder, R. Anderson, S. Weitzman, et al 1989. Characterization of a novel myeloma cell line, MM.1. J. Lab. Clin. Med. 113:335. Moalli, P. A., S. Pillay, D. Weiner, R. Leikin, S. T. Rosen. 1992. A mechanism of resistance to glucocorticoids in multiple myeloma: transient expression of a truncated glucocorticoid receptor mRNA. Blood 79:213. Manna, S. K., H. J. Zhang, T. Yan, L. W. Oberley, B. B. Aggarwal. 1998. Overexpression of manganese superoxide dismutase suppresses tumor necrosis factor-induced apoptosis and activation of nuclear transcription factor-κB and activated protein-1. J. Biol. Chem. 273:13245. Meydan, N., T. Grunberger, H. Dadi, M. Shahar, E. Arpaia, Z. Lapidot, J. S. Leeder, M. Freedman, A. Cohen, A. Gazit, et al 1996. Inhibition of acute lymphoblastic leukaemia by a Jak-2 inhibitor. Nature 379:645. Turkson, J., D. Ryan, J. S. Kim, Y. Zhang, Z. Chen, E. Haura, A. Laudano, S. Sebti, A. D. Hamilton, R. Jove. 2001. Phosphotyrosyl peptides block Stat3-mediated DNA binding activity, gene regulation, and cell transformation. J. Biol. Chem. 276:45443. Schwab, G., C. B. Siegall, L. A. Aarden, L. M. Neckers, R. P. Nordan. 1991. Characterization of an interleukin-6-mediated autocrine growth loop in the human multiple myeloma cell line, U266. Blood 77:587. Borset, M., A. Waage, O. L. Brekke, E. Helseth. 1994. TNF and IL-6 are potent growth factors for OH-2, a novel human myeloma cell line. Eur. J. Haematol. 53:31. Hata, H., H. Matsuzaki, K. Takatsuki. 1990. Autocrine growth by two cytokines, interleukin-6 and tumor necrosis factor α, in the myeloma cell line KHM-1A. Acta Haematol. 83:133. Bataille, R., B. Klein, M. Jourdan, J. F. Rossi, B. G. Durie. 1989. Spontaneous secretion of tumor necrosis factor-β by human myeloma cell lines. Cancer 63:877. Garrett, I. R., B. G. Durie, G. E. Nedwin, A. Gillespie, T. Bringman, M. Sabatini, D. R. Bertolini, G. R. Mundy. 1987. Production of lymphotoxin, a bone-resorbing cytokine, by cultured human myeloma cells. N. Engl. J. Med. 317:526. Miscia, S., M. Marchisio, A. Grilli, V. Di Valerio, L. Centurione, G. Sabatino, F. Garaci, G. Zauli, E. Bonvini, A. Di Baldassarre. 2002. Tumor necrosis factor α (TNF-α) activates Jak1/Stat3-Stat5B signaling through TNFR-1 in human B cells. Cell Growth Differ. 13:13. Guo, D., J. D. Dunbar, C. H. Yang, L. M. Pfeffer, D. B. Donner. 1998. Induction of Jak/STAT signaling by activation of the type 1 TNF receptor. J. Immunol. 160:2742. Keller, E. T., W. B. Ershler. 1995. Effect of IL-6 receptor antisense oligodeoxynucleotide on in vitro proliferation of myeloma cells. J. Immunol. 154:4091. Natarajan, C., J. J. Bright. 2002. Curcumin inhibits experimental allergic encephalomyelitis by blocking IL-12 signaling through Janus kinase-STAT pathway in T lymphocytes. J. Immunol. 168:6506. Li, W. Q., F. Dehnade, M. Zafarullah. 2001. Oncostatin M-induced matrix metalloproteinase and tissue inhibitor of metalloproteinase-3 genes expression in chondrocytes requires Janus kinase/STAT signaling pathway. J. Immunol. 166:3491. Kopantzev, Y., M. Heller, N. Swaminathan, S. Rudikoff. 2002. IL-6 mediated activation of STAT3 bypasses Janus kinases in terminally differentiated B lineage cells. Oncogene 21:6791. Schreiner, S. J., A. P. Schiavone, T. E. Smithgall. 2002. Activation of STAT3 by the Src family kinase Hck requires a functional SH3 domain. J. Biol. Chem. 277:45680. Ren, Z., T. S. Schaefer. 2002. ErbB-2 activates Stat3 α in a Src- and JAK2-dependent manner. J. Biol. Chem. 277:38486. Zamo, A., R. Chiarle, R. Piva, J. Howes, Y. Fan, M. Chilosi, D. E. Levy, G. Inghirami. 2002. Anaplastic lymphoma kinase (ALK) activates Stat3 and protects hematopoietic cells from cell death. Oncogene 21:1038. Garcia, R., T. L. Bowman, G. Niu, H. Yu, S. Minton, C. A. Muro-Cacho, C. E. Cox, R. Falcone, R. Fairclough, S. Parsons, et al 2001. 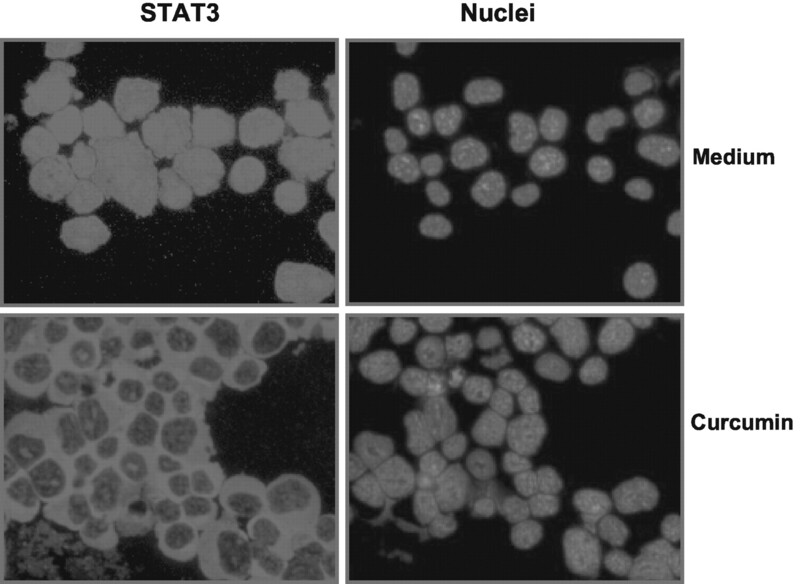 Constitutive activation of Stat3 by the Src and JAK tyrosine kinases participates in growth regulation of human breast carcinoma cells. Oncogene 20:2499. Zhang, Y., J. Turkson, C. Carter-Su, T. Smithgall, A. Levitzki, A. Kraker, J. J. Krolewski, P. Medveczky, R. Jove. 2000. Activation of Stat3 in v-Src-transformed fibroblasts requires cooperation of Jak1 kinase activity. J. Biol. Chem. 275:24935. Zong, C. S., J. Chan, D. E. Levy, C. Horvath, H. B. Sadowski, L. H. Wang. 2000. Mechanism of STAT3 activation by insulin-like growth factor I receptor. J. Biol. Chem. 275:15099. Wang, Y. Z., W. Wharton, R. Garcia, A. Kraker, R. Jove, W. J. Pledger. 2000. Activation of Stat3 preassembled with platelet-derived growth factor β receptors requires Src kinase activity. Oncogene 19:2075. Jain, N., T. Zhang, W. H. Kee, W. Li, X. Cao. 1999. Protein kinase Cδ associates with and phosphorylates Stat3 in an interleukin-6-dependent manner. J. Biol. Chem. 274:24392. Sellers, L. A., W. Feniuk, P. P. Humphrey, H. Lauder. 1999. Activated G protein-coupled receptor induces tyrosine phosphorylation of STAT3 and agonist-selective serine phosphorylation via sustained stimulation of mitogen-activated protein kinase: resultant effects on cell proliferation. J. Biol. Chem. 274:16423. Liu, J. J., K. Nakajima, T. Hirano, H. F. Yang-Yen. 1998. Activation of Stat3 by v-Src is through a Ras-independent pathway. J. Biomed. Sci. 5:446. Park, W. Y., J. H. Ahn, R. A. Feldman, J. S. Seo. 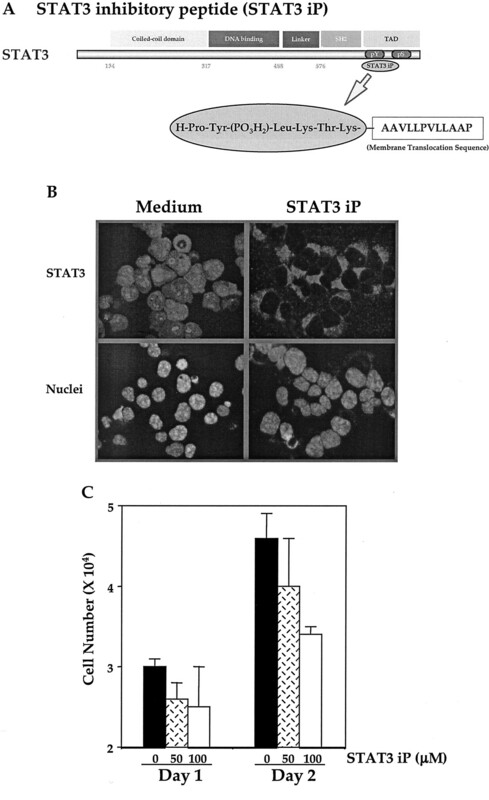 1998. c-Fes tyrosine kinase binds to and activates STAT3 after granulocyte-macrophage colony-stimulating factor stimulation. Cancer Lett. 129:29. Chaturvedi, P., M. V. Reddy, E. P. Reddy. 1998. Src kinases and not JAKs activate STATs during IL-3 induced myeloid cell proliferation. Oncogene 16:1749. Park, O. K., T. S. Schaefer, D. Nathans. 1996. In vitro activation of Stat3 by epidermal growth factor receptor kinase. Proc. Natl. Acad. Sci. USA 93:13704. Nelson, K. L., J. A. Rogers, T. L. Bowman, R. Jove, T. E. Smithgall. 1998. Activation of STAT3 by the c-Fes protein-tyrosine kinase. J. Biol. Chem. 273:7072. De Vos, J., M. Jourdan, K. Tarte, C. Jasmin, B. Klein. 2000. JAK2 tyrosine kinase inhibitor tyrphostin AG490 downregulates the mitogen-activated protein kinase (MAPK) and signal transducer and activator of transcription (STAT) pathways and induces apoptosis in myeloma cells. Br. J. Haematol. 109:823. Reddy, S., B. B. Aggarwal. 1994. Curcumin is a non-competitive and selective inhibitor of phosphorylase kinase. FEBS Lett. 341:19. Hong, R. L., W. H. Spohn, M. C. Hung. 1999. Curcumin inhibits tyrosine kinase activity of p185neu and also depletes p185neu. Clin. Cancer Res. 5:1884. Korutla, L., R. Kumar. 1994. Inhibitory effect of curcumin on epidermal growth factor receptor kinase activity in A431 cells. Biochim. Biophys. Acta 1224:597. Yu, C. L., D. J. Meyer, G. S. Campbell, A. C. Larner, C. Carter-Su, J. Schwartz, R. Jove. 1995. Enhanced DNA-binding activity of a Stat3-related protein in cells transformed by the Src oncoprotein. Science 269:81. Bowman, T., R. Garcia, J. Turkson, R. Jove. 2000. STATs in oncogenesis. Oncogene 19:2474. Bromberg, J. F., M. H. Wrzeszczynska, G. Devgan, Y. Zhao, R. G. Pestell, C. Albanese, J. E. Darnell, Jr.. 1999. Stat3 as an oncogene. Cell 98:295. Takeda, K., T. Kaisho, N. Yoshida, J. Takeda, T. Kishimoto, S. Akira. 1998. Stat3 activation is responsible for IL-6-dependent T cell proliferation through preventing apoptosis: generation and characterization of T cell-specific Stat3-deficient mice. J. Immunol. 161:4652. Shen, Y., G. Devgan, J. E. Darnell, Jr., J. F. Bromberg. 2001. Constitutively activated Stat3 protects fibroblasts from serum withdrawal and UV-induced apoptosis and antagonizes the proapoptotic effects of activated Stat1. Proc. Natl. Acad. Sci. USA 98:1543. Song, J. I., J. R. Grandis. 2000. STAT signaling in head and neck cancer. Oncogene 19:2489. Yoshikawa, H., K. Matsubara, G. S. Qian, P. Jackson, J. D. Groopman, J. E. Manning, C. C. Harris, J. G. Herman. 2001. SOCS-1, a negative regulator of the JAK/STAT pathway, is silenced by methylation in human hepatocellular carcinoma and shows growth-suppression activity. Nat. Genet. 28:29. Zhang, Q., P. N. Raghunath, L. Xue, M. Majewski, D. F. Carpentieri, N. Odum, S. Morris, T. Skorski, M. A. Wasik. 2002. Multilevel dysregulation of STAT3 activation in anaplastic lymphoma kinase-positive T/null-cell lymphoma. J. Immunol. 168:466. Galm, O., H. Yoshikawa, M. Esteller, R. Osieka, J. G. Herman. 2003. SOCS-1, a negative regulator of cytokine signaling, is frequently silenced by methylation in multiple myeloma. Blood 101:2784. Lal, B., A. K. Kapoor, P. K. Agrawal, O. P. Asthana, R. C. Srimal. 2000. Role of curcumin in idiopathic inflammatory orbital pseudotumours. Phytother. Res. 14:443. Lal, B., A. K. Kapoor, O. P. Asthana, P. K. Agrawal, R. Prasad, P. Kumar, R. C. Srimal. 1999. Efficacy of curcumin in the management of chronic anterior uveitis. Phytother. Res. 13:318. Plummer, S. M., K. A. Hill, M. F. Festing, W. P. Steward, A. J. Gescher, R. A. Sharma. 2001. Clinical development of leukocyte cyclooxygenase 2 activity as a systemic biomarker for cancer chemopreventive agents. Cancer Epidemiol. Biomarkers Prev. 10:1295. Cheng, A. L., C. H. Hsu, J. K. Lin, M. M. Hsu, Y. F. Ho, T. S. Shen, J. Y. Ko, J. T. Lin, B. R. Lin, W. Ming-Shiang, et al 2001. Phase I clinical trial of curcumin, a chemopreventive agent, in patients with high-risk or pre-malignant lesions. Anticancer Res. 21:2895. Sharma, R. A., H. R. McLelland, K. A. Hill, C. R. Ireson, S. A. Euden, M. M. Manson, M. Pirmohamed, L. J. Marnett, A. J. Gescher, W. P. Steward. 2001. Pharmacodynamic and pharmacokinetic study of oral curcuma extract in patients with colorectal cancer. Clin. Cancer Res. 7:1894.